For the specific North and South regions, see their respective pages. The Western Coast stretches from the southern-most obelisk to a frozen inlet, nestled between the bottom of the avalanche zone and the "Jaws Outcrop". 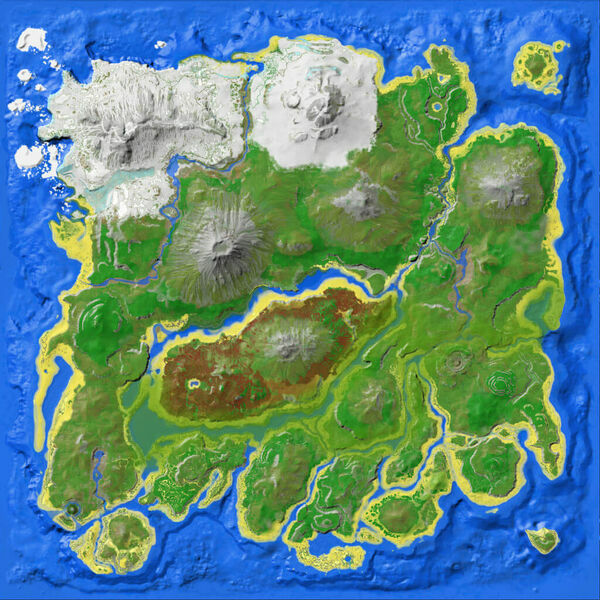 This region is variable, serving as a home for those who prefer to build their bases on the beach, but don't want other players constantly re-spawning on top of them. The Western Coast is mostly tropical beach (frozen inlet at the northern end aside). Starting from the north, there is the aforementioned frozen inlet, with berglings (really small icebergs) and above-water oil deposits. Next, there is a large plain of sand and palm trees, perfect for a large tribe of beach-dwellers. Many dinos and Argentavis spawn at the northwesternmost point and get into large brawls, making it a great location for collecting meat. However, it is not recommended to join unless you have a strong mount with lots of health, such as a Rex. Moving south, there are cliffs and a pair of waterfalls, with a reasonably wide sandy space between them (complete with more palm trees). Next is a wide but inclined section of beach, followed by a pair of rocky outcrops with a settle-able channel between them. What follows is a very long stretch of beach punctuated by large rocks. Also along this section is a quite long but relatively narrow bay, with narrow beaches on both sides. The bay is deep enough to accommodate nearly any marine activities or constructions, though it is shallower near the bay's mouth. Coel, trilobites, and sometimes sarcos frequent the bay. South of the bay stretches a narrow beach overlooked by cliffs. Next is an area of wide empty beaches backed by forests where players can respawn, and finally the obelisk (currently the red obelisk). At the very southern tip of the Western Coast is a small island, cut off from the mainland by two channels that connect the red obelisk's moat to the sea. Despite forming part of the obelisk's rock encirclement, the island does not connect to the obelisk's platform. The island is near spawn areas, but spawning onto the island itself is extremely rare. Plus, aside from an occasional dilophosaur, carnivores don't appear to spawn on the island. A Megalodon does often spawn within the Obelisk's moat and Megapiranha can spawn in the wider channel separating it from Cragg's Island, keeping random travelers to a minimum. Basic resources are readily available and the smooth stones that permeate the nearby obelisk ramps provide sufficient metal for low-tier crafting. In short, the island acts as an excellent haven from many of the hazards of ARK, especially good for new survivors. This page was last edited on 3 February 2019, at 15:38.